Written in Gaelic, this title is a celebration of Highland Cattle with photographs and paintings showing this wonderful breed in its natural habitat. The text discusses the breeds attributes and the effect it has had on Highland tourism and also covers aspects of droving, markets and agricultural shows. 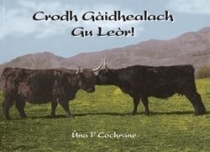 This title has been written with care and has been very well researched, making it a valuable resource for anyone interested in the history of this breed of cattle or the nature of agricultural life in the Highlands of Scotland.